To land the position, avoid these generic phrases. The ultimate goal of a job interview is to make a lasting impression on the hiring manager—a positive one, of course. (Avoid these blunders at all costs.) A surefire way to blend in: answering questions with clichéd statements. Instead of relying on the banal, “provide concrete evidence when responding to each question,” advises Chery Sutjahjo, talent advocate at Hired.com, a service that connects tech and sales talent with employers. Thus, the more specificity, the better. Fortunately for job seekers, hiring managers often ask the same questions (e.g., “What are your strengths and weaknesses?”), says Robert Hosking, executive director of OfficeTeam, a California-based staffing firm. That gives you the opportunity to prepare some killer responses. However, “for fear of sounding overly rehearsed or robotic, you don’t want to memorize answers word-for-word,” says David Lewis, president and founder at OperationsInc, an HR consulting firm in Norwalk, Connecticut. 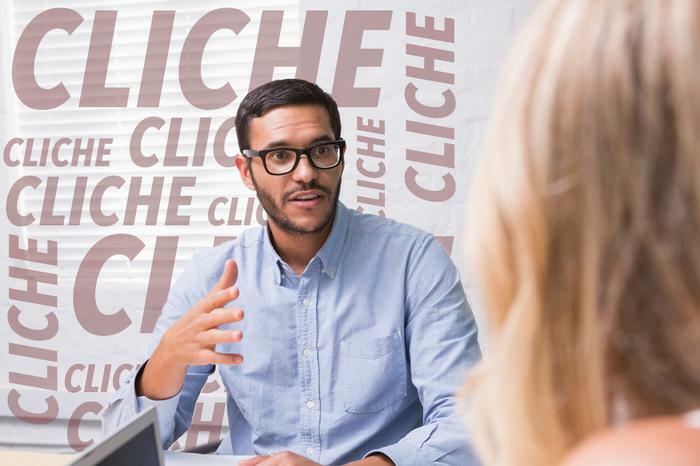 Up your interviewing prowess by erasing these phrases from your vocabulary. It’s a common response to what’s perhaps the most important question of the interview process: “Why should we hire you?” Nonetheless, it’s a blanket statement—and toes the line between sounding confident and arrogant, warns Sabrina Yu, managing director at fashion and beauty branding agency SelectNY in New York. A less trite response: “When I read the job description, I thought to myself ‘that sounds like me,’” suggests Stefanie Wichansky, CEO at management consulting and staffing firm Professional Resource Partners in Randolph, New Jersey. In that case, however, you’re telling—not showing—how you’re a leader, explains Wichansky. To sell your skills, talk about a team assignment you worked on and how you stepped into the role of project manager. Then add color by including specifics like the time frame, budget, and challenges you had to overcome. Yet, again, you need to present an example from your past work experience that illustrates how you’re a team player. For example, “While I worked in the marketing department, I met with colleagues in accounting each month to discuss ways to trim the company’s budget.” Also, offer an example of when you helped a co-worker in a pinch, suggests Hosking. For one, it’s not true. “Every single person, in every role, at every level, has weaknesses,” says Yu. While the subject might be nerve-wracking, “hiring managers appreciate sincerity and humility,” says Wichansky, adding that the weakness you reference should be ancillary to the job (e.g., don’t draw attention to the fact that you lack management experience if the position requires you to oversee a direct report). A safe bet (for many industries) is to say that your PowerPoint skills could be stronger; therefore, you’re taking a class to improve. No matter the weakness, “talk about what you’re doing to overcome it,” says Lewis. Many job seekers presume it’s what the interviewer wants to hear, but that’s often not the case. “Saying you’re a perfectionist makes me question how well you are at prioritizing your time,” says Sutjahjo. Wichansky agrees: “Does being a perfectionist mean you’re going to have trouble meeting deadlines because you’re checking things over and over again?” The solution? Tweak the framing by saying that you’re “detail-oriented” and, naturally, provide a past example. Caveat: Some jobs are best suited for perfectionists, such as a copy editor. This term also has a negative connotation. “In today’s workplace, where so many people value work-life balance, it’s a dirty word,” says Hosking. Furthermore, being a workaholic may not be the right cultural fit for the company, and many managers want direct reports to disconnect on nights and weekends so that they can recharge. Some people say it as a knee-jerk reaction when asked why they left their previous job. But no matter the situation, “never disparage another company,” says Wichansky. Instead, use the question as an opportunity to flatter your prospective employer. Perhaps you’ve followed the company for years and see this as a great opportunity for someone with your particular skill set and experience. “Make sure the hiring manager knows how passionate you are about the organization,” says Sutjahjo.